It seems the Transformers are keen on keeping up with the times. The Decepticon Ravage–formerly one of Soundwave’s microcassettes–now takes the alternate form of an honest-to-goodness 2GB USB flash drive, a more contemporary storage medium. Sure, but where were you in the 90s, buddy? I would have paid good money (well, Canadian money, anyway) to have seen you and Laserbeak popping out of the carousels in a Soundwave multi-disc CD changer. But I guess, “Click-clack! Rattle, rattle, rattle, rattle. Click-clack! Whirrrrrrrrrrrr,” isn’t a particularly dramatic preamble to some eject-and-transform action, eh? 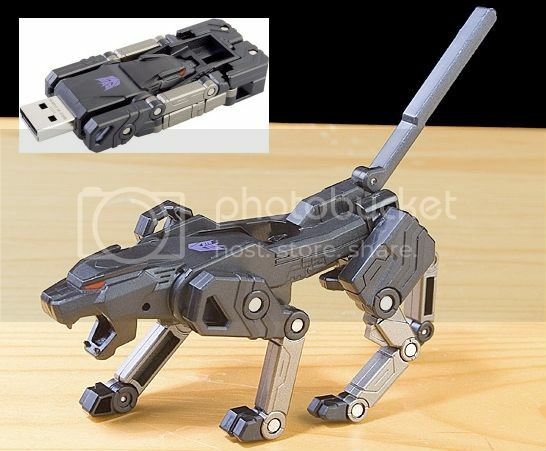 Find the Ravage Transformers USB drive on Amazon and on Ebay. Via Geek Alerts, who likes its Transformers every which way but Bay. I have no real use for this, but want it badly anyway!